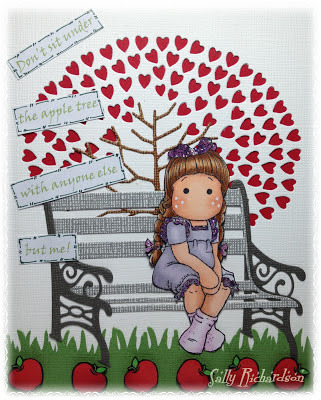 Bizzi Hands: Don't sit under the apple tree with anyone else but ME! I've made for my wonderful husband for Valentine's day. And you're quite right in asking - what the heck? and as we dont have a patio or shade - we've been sitting under it. Of course it reminded me of the song and so I've been singing it for the last month or two..
Righto down to business now - I've coloured a Magnolia image with my copics and used the Memory box dies - twiggy tree with the heart canopy and the Madison Park Bench is a Poppy die. I hope you like it as much as the husband did.